“It’s not ICE London without the ICE Daily,” said head of marketing and PR at BetConstruct, Shuk Manukyan yesterday and as InterGame is not one to disappoint, the day three edition of the industry’s biggest show daily is now available in digital format, viewable directly from your smartphone, tablet, Mac or PC. 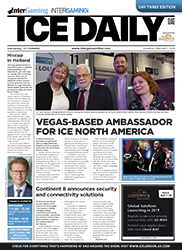 The third and final ICE Daily of 2019 headlines with news of Roy Student joining with Clarion Gaming to serve as ambassador for ICE North America. Updates on the Dutch senate’s discussions on legalising online gambling and the latest from Quixant, Realistic Games, Cammegh, Aristocrat and Bmit among many others await.